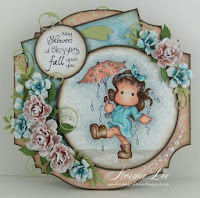 Crafting With Dragonflies Challenge Blog: Challenge #14 winners Post plus some other things! Hello Everyone, my, isn't November flying along - how many weeks left to Christmas? Don't tell - I will become too panicky! Well, didn't our last Challenge (#14) go gang busters! You were all asked to make your own flower embellies, and these did not have to be attached to anything but you all did attach them - clever people! Many of you didn't tell us how you made them though - or if there was a tutorial link, it wasn't added. Some flowers were made from amazing things - fabric, gauze, ribbons, old paper.......and looked spectacular. 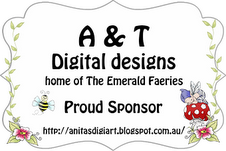 Our Sponsor for this challenge was Emerald Fairies and the winner gets two images of their choice. Don't forget to also collect your winners badge from the sidebar and display it in your next blog to brag a little! #14 Norma - Amazing ability to make handmade look store bought. 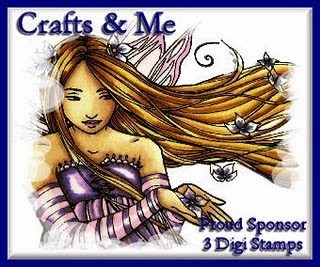 Be sure to check out her blog for both inspiration and tutorials! #28 Gail - For hand cut flowers and the bravery to show off her toes. She's getting ready for sandal season and here in Canada we've stopped shaving our legs (much to our husband's horror, lol). It's not like anyone (besides husbands) are going to see them for the next 6 months, rofl. Congratulations to all of you and please don't forget to collect the TOP THREE badge and display it proudly. Sponsored this fortnight by -3 digis of your choice! Isn't that a stunner! Love the feathers Barb! As you can see, Barb has included two stick pins in her card - it MUST BE A CARD - and some of us have put more than one but you can use one, two , three or whatever.....you can make them or use store-bought ones, or ones that have been gifted to you. Just use a stick-pin in your card somewhere. As we are so close to Christmas, I assume we will get lots of Christmas cards but you don't have to make a Christmas one - make whatever kind of card you wish - but it is a good chance to make that extra-special card for someone. Go a bit OTT (over the top) as I did, or Hilde; or keep it simple like Tania, Wynn or Judith did, allowing the inks and stamping to shine. Or you can look at Kelli's card. Go on, have a tour around and then - add a stick pin to a card and enter it! Thank you so much for picking my card to be in your top 3. I'm amazed.